Parquet wood flooring dates back to the 1600s, when the patterns were laid by hand in palaces and the homes of the wealthy. New techniques of manufacturing saw a resurgence of parquetry in the 1950s. It has become a hallmark of mid-century modern design. Interestingly, because of those advances in manufacturing, parquet wood flooring is easier to install than traditional hardwood. Parquet flooring consists of small strips of wood that’s arranged into patterns. Manufacturers start by cutting the boards into shallow, uniform strips. They arrange the strips into the desired pattern — forming tiles of the pattern. To hold these tiles together, manufacturers bond the back of the wood to a mesh made of plastic, paper, or cloth or to plywood. Engineered parquet is similar to solid wood in that the tiles consist of strips of hardwood. However, manufacturers use much thinner strips to create multiple layers instead of solid wood blocks. Parquet tiles come in three basic sizes: 9-inch by 9-inch, 12-inch by 12-inch, and 18-inch by 18-inch. Their thickness ranges between 5/16 to 3/4 of an inch. Contractors lay the tile in distinct layouts so the patterns create a unique look. 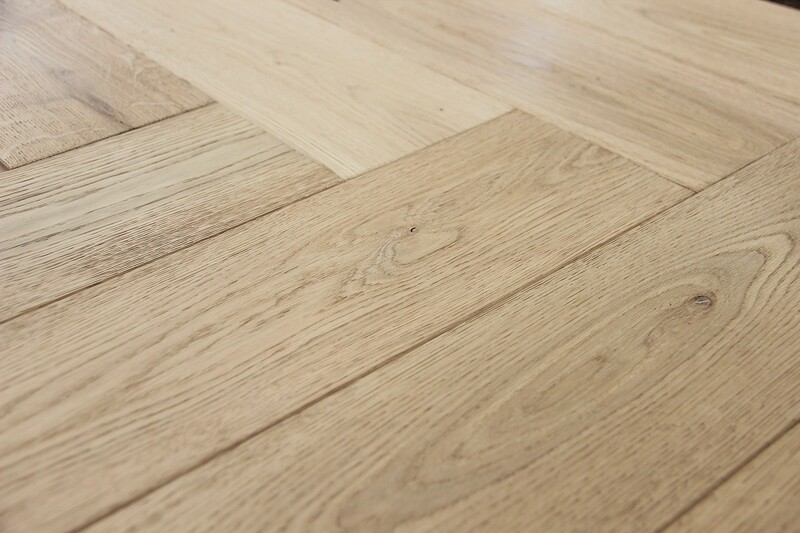 Common woods for parquet flooring are oak, walnut, and ash. You can get parquet tiles made out of exotic hardwoods, too. As noted above, the fact that parquet wood flooring comes in tiles makes it relatively easy to install. Usually, the tiles feature tongue-and-groove edges, which allow contractors to glue them down. However, some of the thicker tiles must be nailed down to a subfloor in the manner of traditional hardwood floor installation. The beauty of parquet flooring comes in its staining or finishing. Manufacturers can stain and seal the tiles in the factory, or they can be finished onsite by the contractors. Finishing onsite allows for more customization. Stains darken the wood color, which can help emphasize a pattern. For finishes, contractors typically use either an oil-based or water-based polyurethane, with the former being more durable. Parquet tiles can come in numerous pattern options. The most common is the herringbone pattern, which creates chevrons out of the strips of wood. The herringbone pattern is relatively subtle, but you can emphasize the shapes with staining. Another popular style is a basket weave, which features strips that appear to weave in and out of each other. Finger block is another weave pattern. However, in this case, the tiles are made of narrow strips aligned in one direction. Contractors lay the tiles in alternating directions to create the weave. Parquet tile patterns can get quite elaborate. The contractors can utilize smaller tiles to create a large pattern complete with intricate details. As with any tile floor, contractors can lay the entire floor in parquet. This use is especially suitable for large, formal rooms. However, an elaborate parquet floor can look stunning in a small space, such as a foyer. Many homeowners use parquet tiles as borders for a standard hardwood floor. So you see an expanse of the classic hardwood, but a decorative stained section borders the center — the effect is almost like a carpet. You can also choose to have a parquet medallion installed in the center of a large floor. These medallions are usually very elaborate. Such an installation is suitable for a formal space, such as a library. Just make sure you’re going to leave the medallion exposed when you furnish the room. Parquet wood flooring is ideal for any space where you want to make a statement. When you’re ready to discuss your hardwood flooring options, visit with the experts at Wood Floors Unlimited, Inc.